How is this for a bold assertion: All your clothes are made with exploited labor. That is the title of a recent Atlantic article which discusses what Patagonia learned when it audited the practices of its second-tier suppliers. These are not the firms sewing sweaters or assembling backpacks. Rather these are the mills producing fabric and factories producing components that go into those sweaters and backpacks. It turns out that a lot of those mills were engaged in some dubious practices. About one-quarter of those mills are based in Taiwan, and the majority were found to have instances of trafficking and exploitation. What’s your address? For most readers of this blog, that is a pretty easy question to answer. You have a street name and a unique number. Throw in a postal code and maybe an apartment number, and you are good to go. For much of the world’s population, however, things aren’t so easy. Whether because they live in rural villages or poorly planned, rapidly growing cities, many people in developing nations don’t have a standard address. This creates a variety of problems. In particular, it cuts them off from many parts of modern commerce. How do you deliver a package to someone who can’t easily write down where they live? Note that this matters for a developing nation. If a country has an under-developed retail market, fostering an e-commerce industry is likely a better solution for many products than building out physical locations — but that cannot happen without some way of locating customers. 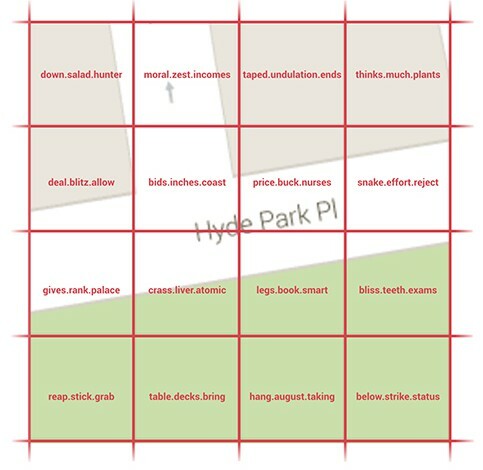 Solving this addressing problem is the goal of what3words, a start-up firm profiled in a recent BBC article (Giving everyone in the world an address, Apr 30). Their plan is to match every three-meter-by-three-meter square on the globe with a three-word triplet. Under this scheme, the house I grew up in becomes collapsed.networking.farm — which would only be better if it were collapsed.networking.firm. The argument is that it is easier to remember three words than, say, a set of random numbers. The goal then is to come up with words that are simple and unambiguous to use. Here is how their website explains the process. Each what3words language is powered by a wordlist of 25,000 dictionary words. The wordlists go through multiple automated and human processes before being sorted by an algorithm that takes into account word length, distinctiveness, frequency, and ease of spelling and pronunciation. The dollar has been on a tear over the past year. Check out how much it has appreciated against the euro over the past year or so (A Shakeup in Currencies, Wall Street Journal, Mar 19). There are some obvious implications from this chart. For example, if you spent spring break in Europe, you have an impeccable sense of timing. Also, if you are US-based manufacturer counting on exporting to Europe, you are going to be swimming upstream (see, for example, Strong Dollar Stands in Manufacturing Sector’s Way, WSJ, Mar 15). But if a strong dollar hurts US firms, it’s gotta be a godsend for European businesses, right? Well,maybe not. How a weak euro impacts European firms is going to depend on the structure of their supply chains. 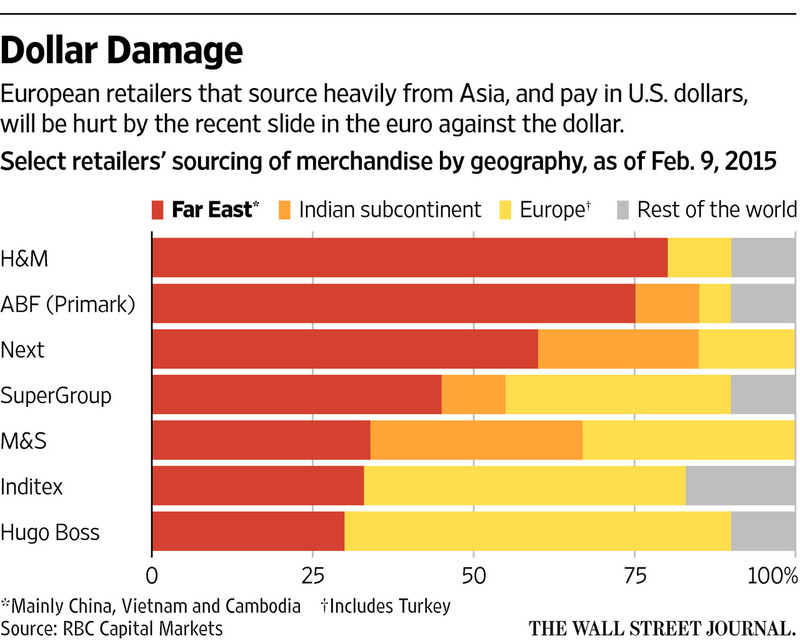 Check out this eye candy from today’s Wall Street Journal (Europe’s Fashion Retailers Under Pressure From Strengthening Dollar, Mar 24). 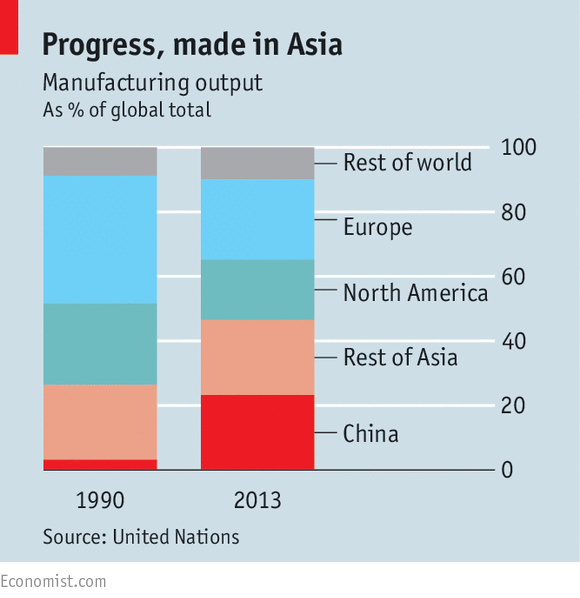 How long will Asia hold on to manufacturing? The vicissitudes of American manufacturing has been a long running topic on this blog. But whether one focuses on firms that have always kept their production in North America or those that have reshored manufacturing, there is the question of whether China or other Asian countries are going down without a fight. A recent article in The Economist suggests that manufacturing in Asia in general and in China in particular is going to be around for a long, long while (A tightening grip, Mar 14). First, one has to recognize that the growth in Asian manufacturing over the last 20-plus yeas has been spectacular. Check out this graphic. What kind of companies move jobs back to the US? Reshoring — moving manufacturing from far-flung global locations back to the US — has been a popular topic both in the general press and on this blog. What’s not to like about it? As long as manufacturing allows average humans without extreme degrees of education or super rare skills to make a decent wage, new employment opportunities in manufacturing are always going to create a buzz. But just what kind of firms are bringing work back to the States? According to the Wall Street Journal, we are mostly talking about smaller enterprises (Bringing Jobs Back to U.S. Is Bruising Task, Jun 25). More than 80% of companies bringing work back to the U.S. have $200 million or less in sales, according to the Reshoring Initiative, a nonprofit that encourages companies to return production to the U.S. Many supply parts to bigger companies or, if they sell directly to consumers, are seeking to cut out lengthy supply chains from Asia. But big companies have the resources and experience to hopscotch around the globe. It’s harder and riskier for small firms to do the same. So for every General Electric moving appliance manufacturing back to Kentucky, you have lots of firms like Chesapeake Bay Candle dealing with much smaller product lines. To some extent this is not too surprising. Whether you are GE or Chesapeake Bay Candle, managing a long supply chain or navigating cultural differences is nontrivial. One of those firms, however, can much more easily absorb the cost of having in country staff or can resort to throwing around its sizable weight to get a good deal. Further, a multinational like GE can also have ambitions of growing in China that may not be a priority for a small player like Chesapeake Bay Candle. Why invest in automation? The answer to that question is often to cut cost — a straight up move to replace labour with capital. That has the obvious implication that firms in high-wage locales like the US should be willing to invest heavily in fancy machinery while those in lower-wage countries like India should be more cautious in doing so. That may not always hold, however. As the Wall Street Journal tells it, there is one Indian industry that is investing heavily in automation and it’s not really about shaving costs. The industry in question is generic pharmaceuticals and the driving force behind the capital investments is maintaining high quality standards (India’s Drug Makers Move Toward Automation, Jun 5). Despite an abundance of low-cost laborers in India, all of [Dr. Reddy’s Laboratories’] plants are moving toward fully automating their production process “to avoid good manufacturing practice pitfalls from regulators,” said Samiran Das, head of Dr. Reddy’s generic drugs manufacturing. In the past decade, India’s pharmaceutical companies have blossomed into multibillion-dollar companies that now account for 40% of the generic drugs sold in the U.S. Those companies, however, have come under increased scrutiny in recent years from the U.S. FDA, for manufacturing, testing and other safety issues that are often the result of human error. Reshoring has been a popular topic. It’s a lot more fun to talk about optimistic stories of manufacturing and its associated jobs returning to the US (or to high wage developed nations in general) than to focus on companies sending jobs overseas in search of cheaper labor. But how does reshoring go in practice? Once a company commits to bringing work back to the States, how easy it to get a factory up and running? As the Wall Street Journal tells it, reshoring is not a walk in the park, at least not for United Technologies’ Otis Elevator (Otis Finds ‘Reshoring’ Manufacturing Is Not Easy, May 2). The company’s move to relocate an Otis elevator plant from Mexico to South Carolina in late 2012 was hailed as a sign of a small renaissance in American manufacturing. The relocation was supposed to save money and help fill orders faster by putting the people who make new elevators next to the engineers who design them, and their customers. Now, it’s clear the reality hasn’t been so smooth. Production delays created a backlog of overdue elevators. Some customers canceled their orders after being left waiting months, people in the elevator industry said. The plant Otis was leaving behind in Nogales, Mexico, had to stay open for half a year beyond its planned closing date to deal with the backlog.